Add cashews and desiccated coconut to a high speed blender or food processor and blend until nice and smooth. Add the maple syrup, peppermint and sea salt to the mixture, blend until creamy. Add the mixture to a lined baking pan, smoothing over with a spatula or back of a spoon. Place into the freezer until frozen, approximately 60 minutes. To make the chocolate coating, melt the coconut oil in saucepan on low heat. Once melted, add the maple syrup (or honey), whisking until well combined. Then add the cacao powder, stirring well until well mixed through. Take the mint out of the freezer and cut into squares or rectangles. Then dip each piece into the chocolate sauce and place on a wire rack on top of lined baking tray (make sure the tray fits in your freezer). Freeze until the chocolate has hardened (approximately 30 – 60 minutes). 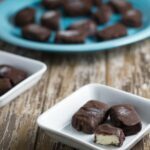 Optional – dip the pieces again, so that they are double coated in the chocolate coating.